Forget worrying about FastPasses – this new private dining experience at Disneyland in California offers guests a chance to dine like kings, literally. 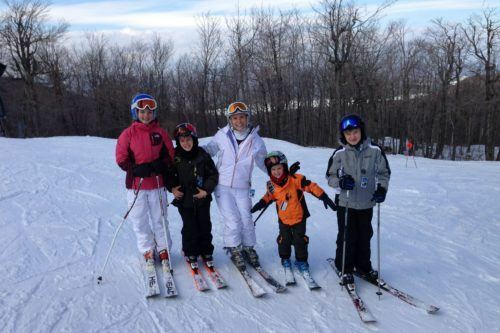 This experience is so hidden that you have to be “in the know” to book it, and now you are. The entrance is speakeasy subdued, just a small hanging sign above the Pirates of the Caribbean ride. From the crowded sidewalk below you would never know the secret behind the subtly gilded doors just one flight up. The marketing photos don’t do it justice, and I wasn’t allowed to so much as pull my phone out during dinner. So let me paint a lovely word picture for you. You have a reason to celebrate, a big anniversary or birthday and you want to throw the ultimate dinner party. Who would you hire to cater it for you? 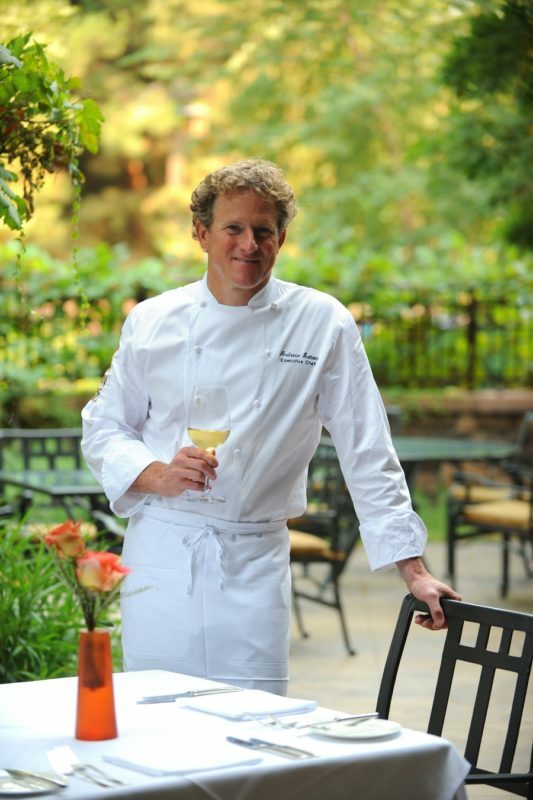 Perhaps a world renowned chef like Andrew Sutton (former head chef at famed Auberge du Soleil)? Does he do personal dinner parties? Of course not, but this is Disney magic people, so Andrew Sutton is your personal chef and he is going to create a meal just for you from the most amazing ingredients on earth. Black truffles so huge they look like baseballs, desserts so perfect and decadent you can’t imagine how they were made. Forget a bartender, you need a real sommelier who has access to some of the best and most exclusive wines in the world. Matt Ellingson oversees the wine at 21 Royal, Club 33 and Napa Rose. On a recent dinner I was lucky enough to spend time in Napa Rose’s wine cellar perusing their collection of Screaming Eagle and Sine Qua Non wines. If you’re not a wine-o like me, just know that these bottles are almost impossible to come by for mere mortals. Matt will create a signature cocktail for your dinner party and pair the perfect wines to the personally created menu. 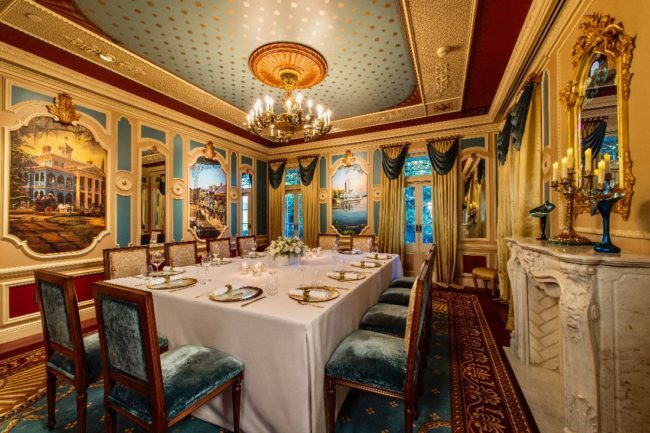 And this magical dinner party has to be in the happiest place on earth, of course, and the most exclusive address in Disneyland is now 21 Royal Street. This was the home designed for Walt and Lillian Disney by the designer behind Gone with the Wind, but not completed until recently. You and your guests (the party can be up to 12 people) are tended to by a professional butler staff (some of whom have worked for royalty, but I can’t say who). They don’t allow photos of all of the rooms, but in each of the bedrooms (no one is allowed to sleep there) there is a “Goodnight Kiss” button on the wall. When pushed, the lights dim and in one room, a tiny train begins its journey around the top of the room passing vignettes that inspired the parks, in the other, a projected light and music show begin that is so soothing it is surely what princesses nod off to sleep to. Your private dinner lasts around five hours starting with cocktails on the patio under twinkle lights, moving to the dining room for seven courses of heaven served on gilded plates and concludes with coffee and dessert on the verandah. Many nights you’ll enjoy the most coveted fireworks viewing spot in the entire state, complete with coffee served in fine china cups and constantly refreshed by your ever attentive butler. No squatting on the sidewalk or stale popcorn for you tonight. On your way out the door your butler staff will present you with a gift bag including a copy of the evening’s menu and some New Orleans style breakfast treats to remember your magical evening. And just like that, you go from royalty back to reality. I’m not easily impressed, and this experience blew me away. The total is cost is $15,000 and includes everything. 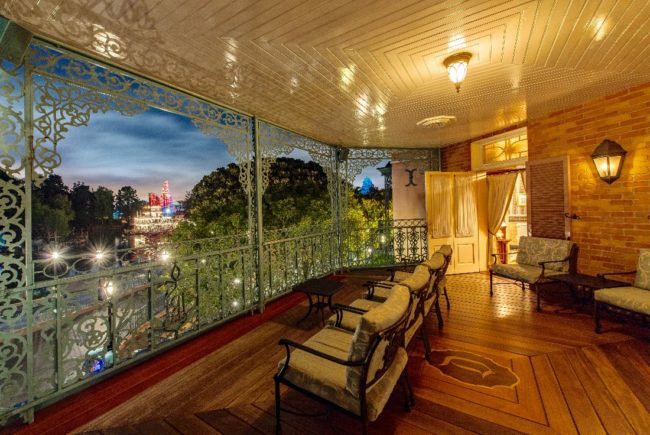 I actually believe this is an experience that you can’t put a price tag on, there is no other time you would have a world renowned chef, butler to royalty and the use of Walt Disney’s personal home. To book, call the concierge at 714-300-7749. 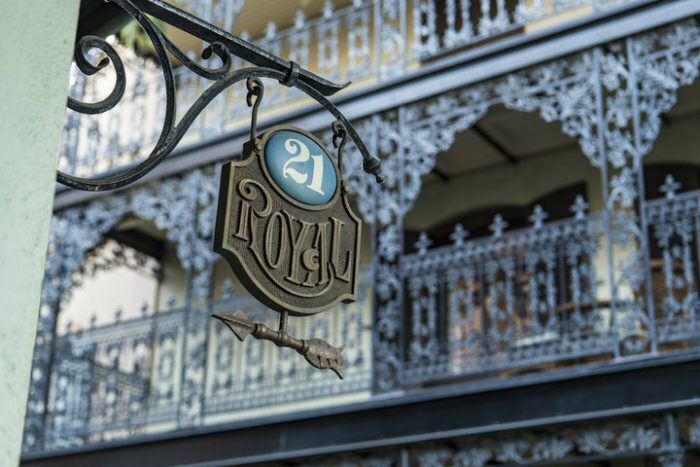 21 Royal is accepting reservations on a six month booking window, which currently extends through Friday, August 31, 2018. At 9:00 a.m. PST on the first of each month, the entire seventh month in the future opens for booking. Future dates for each month will be released one month at a time, on the first of every month. I was hosted for a sample menu and evening of dessert and fireworks as part of a press trip in January.